Or anywhere else for that matter! In no particular order, because doing any one of them could be disastrous, here are the most common mistakes and mess ups that Buyers make after they have met with their lender and made application for a home mortgage. Don’t apply for any other new credit ~ did you know that even applying for satellite TV or an automated fuel account for your new home will affect your credit score in a negative way as most companies run a credit report before responding to your request for those accounts? Don’t close any credit (credit cards, lines of credit) ~ lenders, and your credit score, take into account how many years and how many lines of credit you have, so closing any of them may negatively affect your credit. Don’t make any late payments ~ credit scores decrease every time you have a 30 day late payment so make sure your payments not only get mailed on time, but allow for the time needed for the company to document your payment. 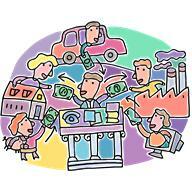 Don’t change your income stream ~ this isn’t the time for a job change! Lenders like to see stability in your work/income so wait until the closing to make any changes. And if you are using a loan program that has income limits, you may even want to turn down that raise as it may bump you out of an income level. Don’t lose contact with your lender or your real estate agent ~ we’re here to help you and make sure that you make it to closing! Share everything with your lender; they need the entire picture of your financial situation to make sure they can help overcome any obstacles. Don’t deposit any undocumented large sums of money into your bank account ~ if you plan to sell your motorcycle for the down payment, please make sure you have a signed bill of sale, documentation on the bikes value and a check for the sale….and get it all to the lender for their approval! IF you remember your do’s and don’ts, you’ll be in a new home in no time! And if you’re still looking for that perfect agent to help you, I’m only a phone call away! ← The 4 C’s of … lending….in Midcoast Maine! Great advice! I don’t think people realize they need to watch what they are doing money wise when they buy a home. Any little change can make a difference!